Once a devotee asked Srila Prabhupada, “What is our qualification to receive this highest knowledge of the super most, topmost realm of the spiritual world?” Srila Prabhupada with all humility and honesty replied, “You had no qualifications, I made your qualifications.” While in Vrindavan, this is something for us to very sincerely meditate upon. For many years Srila Prabhupada lived in the tiny rooms at Sri Sri Radha Damodar mandir. While he was living there he was translating the Srimad Bhagavatam, writing purports and praying to the predecessor acaryas to help and empower him to fulfill the desire of Lord Caitanya. Srila Prabhupada gave up everything for the simple purpose of fulfilling the order of his spiritual master. It was in 1922 that Srila Prabhupada met Srila Bhakti Siddhanta Saraswati Thakur and in the very first meeting received an instruction from him: “You are an intelligent young man, take this message of Lord Caitanya and present it throughout the world in the English language.” Srila Prabhupada posed many questions and would very eagerly tell us how happy he felt on being defeated by his Guru Maharaj. From that moment on, he took that order as his life and soul. After 11 years of his first meeting, Srila Bhakti Siddhanta Saraswati Thakur initiated him in 1933. In 1959 he had recurring dreams of his Guru Maharaj beckoning him to take sannyasa. On September 17th, 1959 Srila Prabhupada took sannyasa at the Kesavaji Gaudiya math and interestingly after the ceremony he spoke in English although the audience was primarily Hindi or Bengali speaking. Srila Prabhupada was deeply inspired by Srila Vishvanath Chakravarti Thakur’s purport to this particular verse from the Bhagavad Gita. “Those who are on this path are resolute in purpose, and their aim is one.” This means to take the will of the spiritual master as one’s life and soul. Srila Prabhupada left everything in the same mood as Lord Caitanya – to give Lord Krishna to the whole world. Here, in Vrindavan, Srila Prabhupada not only prayed, not only desired, but worked tirelessly to prepare himself for that mission. 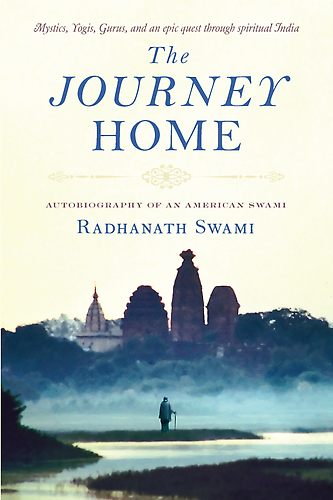 At the age of 70 when most people retire to go to Vrindavan, he boarded the Jaladuta and left for America. It was Srila Prabhupada’s compassionate prayers and his inconceivable sacrifice that was, is, and forever will be the qualification of the people from all over the world to receive the message of Vrindavan in such a true, pure and accessible form.